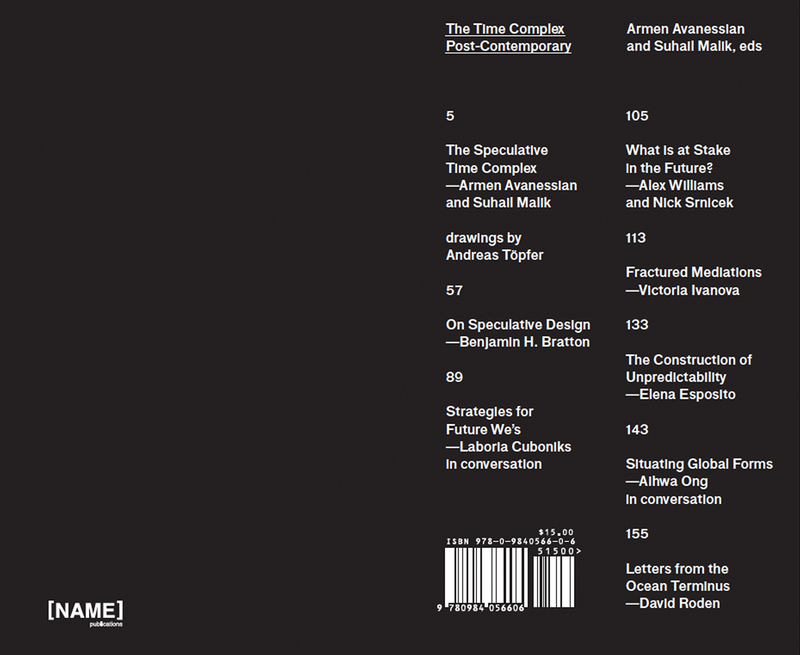 Edited by Armen Avanessian and Suhail Malik, designed by Federico Pérez Villoro with drawings by Andreas Töpfer. Contributions by Benjamin Bratton, Elena Esposito, Victoria Ivanova, Laboria Cuboniks, Aihwa Ong, David Roden, Nick Srnicek & Alex Williams. Time is changing. Human agency and experience lose their primacy in the complexity and scale of social organization today. The leading actors are instead complex systems, infrastructures and networks in which the future replaces the present as the structuring condition of time. As the political Left and Right struggle to deal with this new situation, we are increasingly wholly pre-empted and post-everything. The contributions in The Time Complex. Post-Contemporary re-localize the present as part of a changed, speculative time complex and draw a precise diagnosis of the situation in order to negotiate speculative predictions of a future presence.